Two of the 2018 IAMC Challenge Sites are difficult to get to because there are very poorly marked two-track roads to get to them in the Idaho Benchmark Map book, and no roads indicated in Garmin BaseCamp mapping software. 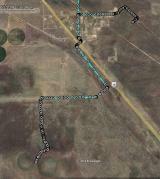 For this reason, I am including my tracks in a GPX file to these two sites. These tracks begin at the Simco Road exit off of I-84 (Exit-74). Take Desert Wind to Ditto Creek then east on Desert Duck to its end continuing past the turn-aroud and follow the rutted two-track to the Aircraft Beacon-26 GPS coordinates. You will not see this site until you are within 10-15 feet of it. From the Aircraft Beacon-26 site retrace your tracks to the junction of Desert Duck and Ditto Creek roads and continue on Ditto Creek road crossing over the I-84 overpass to Cinder Butte Road. Cross the railroad tracks and continue about 1.7 miles to a two-track road leading south to the Craters NNL. The total route from the Simco Road exit off I-84 to Craters NNL is about 21 miles.